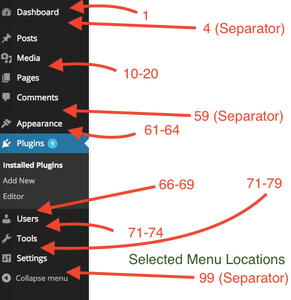 If you want to add menu in wordpress or create a WordPress plugin that need to allow users to change settings from the WordPress dashboard. Adding a WordPress admin menu you allow users to customize your plugin to according to their needs. for easily access our plugin setting we create an admin menu in the dashboard. This menu should have fields where users can customize your plugin to fit their exact needs. we will Use the WordPress function “add_action” along with “admin_menu” Then pass the function name of your menu. The slug name to refer to this menu by. Should be unique for this menu page and only include lowercase alphanumeric, dashes, and underscores characters to be compatible with sanitize_key(). function is the callback for the function you want to render your actual page. This is an integer that determines where (height-wise) in the left sidebar your option should appear, 1 being the top, 99 being the bottom.